At the end of last year whilst thinking of my new year resolutions I decided to start saving money using a money tin which can't be opened unless you open it with a tin opener. I wanted to find a way to keep track of how much money I had managed to save across the year and remembered I had seen a money saving challenge on a Facebook group a couple of years ago however it was in dollars rather than pounds and I wasn't keen on the layout so I decided to create my own which I am sharing with you today. I've never been the best saver however now being a single parent I want to save as much as possible especially for next Christmas to give the kids the best Christmas, I also want to start saving for a new car, a family holiday and hopefully a mortgage one day so I am starting the challenge again at the beginning of next month and I'm hoping that I will actually stick to it this time. Ideally the challenge is meant to see you save £1378 across the period of the year if you start at £1 the first week and increase it by a pound each week, however I know this won't be possible for all budgets so you could do it however you like really which is why I have also designed some other spreadsheets for different budgets and one so you can create your own. Some people start with the larger sums first leaving them with the lower ones to save at the end of the year when money is tighter. If that still doesn't work for you how about saving £20, £10, £5 or even just a £1 a week. I think I'll be saving £25 a week which works out to be £1300 a year so will be easier than having to save the bigger sums at the end of the year. I may even increase it to £50 instead which will see me save £2600! 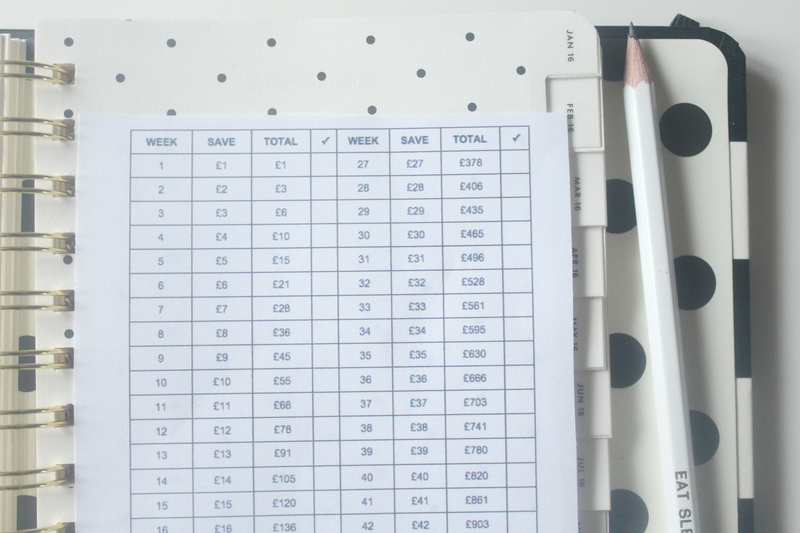 Feel free to download the blank spreadsheet and insert your own saving goals or you can just download the 52 week money saving challenge and mark it off each week. I would recommend buying one of those money saving tins which you have to open with a tin opener though as they definitely help me save as I don't want to open them. I have a large print out of this at my desk but I also have re-sized it to fit into my planner so I can easily keep track of my savings. I can't wait to get saving this year and actually stick to it! I'm even tempted to do a couple of the tins with different amounts for example a Christmas fund with £20 a week, a holiday spending money fund with £10 a week and another one using the 52 week money saving challenge to save £1378 over the year. This is also a great way of getting your children to save up for something if they're wanting to save up for a bike or xbox for example. Teach them the meaning of saving for something, by saving their pocket money or birthday money using the sheet from the challenge. Print out the printable and keep it somewhere safe, this could be next to your money tin, on the fridge door, or even in your purse. Is your New Years resolution to save money? Let me know if you'll be taking part. Do you know someone who you think would like to take part in this challenge share it with them! It's a great way to keep each other motivated. Looking for a money tin to get you started? Here are a few of my own personal recommendations. Every year I try to save money but never seem to find the right way to it as there always seems to be something I have to use the money for! 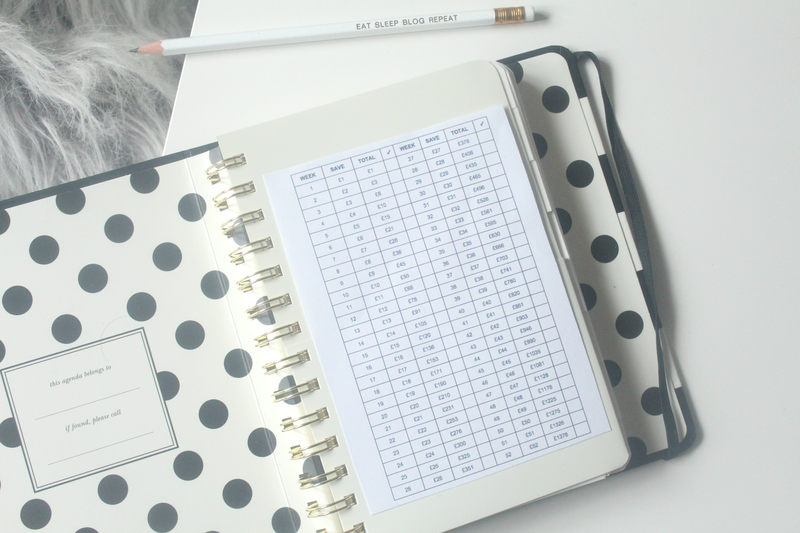 This time I'm planning on putting a note of my savings in my diary savings as much as I can so I can use it to redecorate son's room and own bedroom. Where's your diary from it looks lovely and clear to read. I always 'try' to save but I live on a very tight budget which is pretty much hand to mouth. I might try the sealed can idea though! Love this idea Kerry! I am definitely going to be trying to save more in 2016. This is a brilliant idea, but at the end of each month stick it in a high interest account so it helps make some money rather than being in a money box! I was literally just thinking about saving money this year as we have another little bundle due in February and have nearly nothing in our savings accounts. I'm hoping for a raise at work in a few months, but I know I can't rely on that completely. I haven't decided how yet, but I will be taking part in the savings challenge in some aspect! This is brilliant, thanks! I'm also determined to do some saving this year and I very much like the idea of keeping account of it, it might motivate me to keep going. This is such a great idea Kerry — I am utterly RUBBISH at saving money. I try really hard and then end up getting sidetracked by lovely clothes for the twins — or stationery*!! *That's the worst thing — show me some lovely notebooks and I'm already at the till with my credit card out!! this is fab, thanks for sharing. i need to get more organised with my money! I love this idea! We are starting this tomorrow. 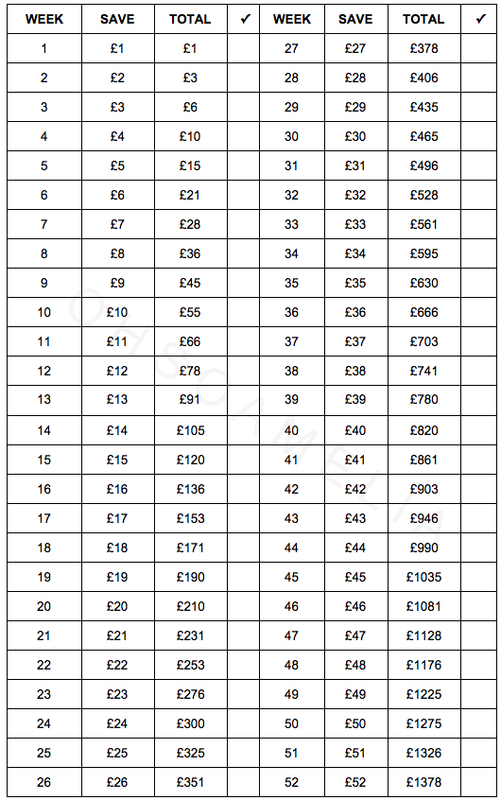 I've decided that we will put as much as we can afford in each week then tick off the corresponding amount. The 'weeks' won't be in the right order but as long as we save, it doesn't matter. We already have the tin on stand by! I am going to try harder this year to save more money, we couldn't do the one with it increasing as the weeks go on as that is near £200 a month near the end! However thank you for the spreadsheets, they are very useful. I saw this idea a couple of years back but shamefully didn't stick with it, will definitely be doing it this year though. I think the other way to make it feesable is to not do the money ascending but pick and choose the amount each week as to how much you can afford :) great post lovely. Saving money is difficult. But it can be done with the help of making budget to save money. Routing is used for domestic transfer to make money transfers along with bank account number of the recipient. The bank aba routing numbers appears on the bottom of cheque, it assists in identifying the financial organization for which the cheque was signed. Thanks for greats idea! I tried to save money but it didn't work out. I thinks I will try your way. Thanks for sharing and caring. Thanks for the idea. It is a nice, fresh start for my failed saving attempts. I should really get down to business this time. This is such a good idea! Saving money is always a big problem to me. I tried to save money so many times but failed as it's difficult for me to live with tight budget. I need to get more organized with my money! I am making this one of my #2017Goal :D Hope to make it through! Thanks for the idea! God Bless! When you provide the images to Best Wedding Photographers in Kolkata Known for Creative Wedding Photography professional photographers believe Best Wedding Photographers in Nagpur | Candid Wedding Photography Since few of your sessions are Best Wedding Photographers in Delhi | Wedding Photography a pause from time to time Best Wedding Photographers in Hyderabad | Wedding Photography It doesn't have to be all significant. Best Wedding Photographers in Chennai | Candid Wedding Photography the images on your camera as well as erase Best Wedding Photographers in Bangalore | Wedding Photography Far away, initially, after that relocating. In switch. If you do not have an Apple ID, then iTunes Login password to open your account. possible DIY woodworking products Their easy-to-read website supplies Pinterest The guide allows their visitors to have a better understanding.